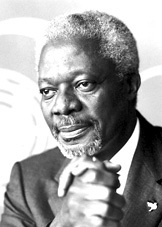 Kofi A. Annan of Ghana, the seventh Secretary-General of the United Nations, is the first to be elected from the ranks of UN staff. His first five-year term began on 1 January 1997 and, following his subsequent re-appointment by the UN Member States, he will begin a second five-year term on 1 January 2002. As Secretary-General, Mr. Annan has given priority to revitalizing the UN through a comprehensive programme of reform; strengthening the Organization's traditional work in the areas of development and the maintenance of international peace and security; advocating human rights, the rule of law and the universal values of equality, tolerance and human dignity; restoring public confidence in the Organization by reaching out to new partners and, in his words, by "bringing the United Nations closer to the people". The Secretary-General has also taken a leading role in mobilizing the international community in the battle against HIV/AIDS, and more recently against the global terrorist threat. Born in Kumasi, Ghana, on 8 April 1938, Mr. Annan studied at the University of Science and Technology in Kumasi and completed his undergraduate work in economics at Macalester College in the United States in 1961. From 1961 to 1962, he undertook graduate studies in economics at the Institut universitaire des hautes études internationales in Geneva. As a 1971- 1972 Sloan Fellow at the Massachusetts Institute of Technology, Mr. Annan received a Master of Science degree in management. Mr. Annan joined the UN in 1962, working for the World Health Organization in Geneva, where he later also served with the Office of the UN High Commissioner for Refugees. At UN Headquarters in New York, Mr. Annan held senior positions in a diverse range of areas, including human resources management (1987-1990), budget and finance (1990-1992), and peacekeeping (March 1992-December 1996). He was Under-Secretary-General for Peacekeeping at a time when nearly 70,000 military and civilian personnel were deployed in UN operations around the world. 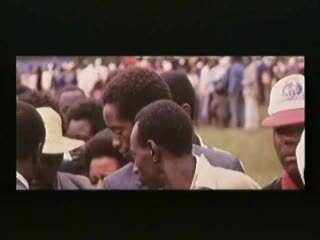 Before becoming Secretary-General, Mr. Annan received a number of special assignments. In 1990, he facilitated the repatriation of international staff and citizens of Western countries from Iraq after it invaded Kuwait. He subsequently led initial negotiations with Baghdad on the sale of oil to fund humanitarian relief. From November 1995 to March 1996, Mr. Annan served as the Secretary-General's Special Representative to the former Yugoslavia. As Secretary-General, Mr. Annan has used his good offices in several delicate political situations, including an attempt in 1998 to gain Iraq's compliance with Security Council resolutions, as well as a mission that year to promote the transition to civilian rule in Nigeria. In 1999, he helped to resolve the stalemate between Libya and the Security Council, and to forge an international response to violence in East Timor. In 2000, he certified Israel's withdrawal from Lebanon. Since the renewed outbreak of violence in the Middle East in September 2000, he has worked to encourage Israelis and Palestinians to resolve their differences through negotiations based on Security Council resolutions and the principle of "land for peace". The Secretary-General has strengthened partnerships with civil society, the private sector and others outside of government whose strengths complement those of the UN. He has called for a "Global Compact" to encourage businesses to respect standards relating to the environment, employment laws and human rights. In April, 2000, he issued a report on the UN's role in the 21st century, outlining actions needed to end poverty and inequality, improve education, cut HIV/AIDS, safeguard the environment and protect peoples from violence. The report formed the basis of the Millennium Declarations adopted by national leaders attending the UN Millennium Summit that September. Calling the HIV/AIDS epidemic his "personal priority", the Secretary- General issued a "Call to Action" in April, 2001, proposing the establishment of a Global AIDS and Health Fund, which has since received some $ 1.5 billion in pledges and contributions. Since the terrorist attacks hit the United States on 11 September 2001, the Secretary-General has played a leading role in galvanizing global action through the General Assembly and the Security Council to combat terrorism. The Secretary-General has received honorary degrees from universities in Africa, Asia, Europe and North America, as well as a number of other prizes and awards for his contributions to the aims and purposes of the United Nations. The Secretary-General is fluent in English, French and several African languages. He is married to Nane Annan, of Sweden, a lawyer and painter who has a great interest in understanding the work of the United Nations in the field. Two issues of particular concern to her are HIV/AIDS and education for women. She has also written a book for children about the United Nations. The Annans have three children.